Handmade Detroit | DUCF 2009 roundup and thanks! Has it really been over a week since DUCF 2009? We just want to send out a big thank you to everyone who worked so hard to make year four happen with gusto — vendors, sponsors, volunteers we salute you. Thanks also to all the people who came out and supported DUCF. The place was jam packed and it’s awesome to see our town supporting local artists so heartily. (The jam packed thing is something we will be taking into consideration for next year’s planning!) We hope everyone had as much fun attending as we do putting on the event. 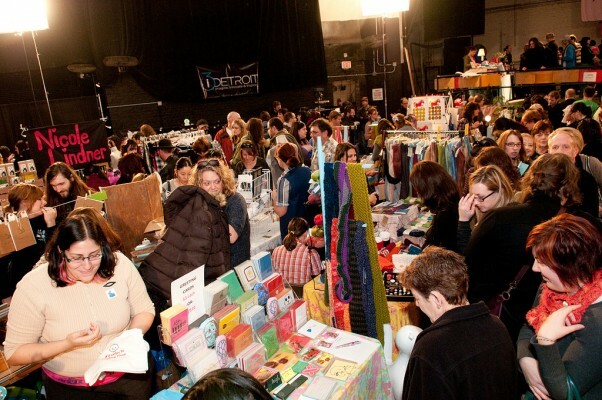 Some of this year’s highlights included Provo Craft’s silkscreen and Cricut tote demo, i-3 Detroit’s Blinky Bug station and of course, all the awesome makers! Thanks to Tafari for capturing all the action and all of our other sponsors for their generous support! Thanks also to everyone who contributed to our online experiment — the 2009 Live Blog. Last count had us around 400 contributions — so we’re calling that one a massive success and hoping to bring back the format in the future. Make sure to read the live blog for a cool rundown of the day’s events. Though the Live Blog is now closed, you can still tag your Flickr photos “ducf09″ to add them to the DUCF stream. Yes, we will be back in Nov. 2010 for year 5. Can you hardly believe it? Bookmark www.detroiturbancraftfair.com and check back next summer for more details.